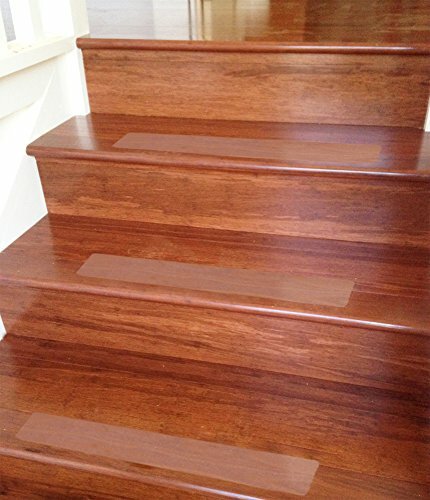 Clear Safety Stair Treads by Ottomanson are the perfect solution to make your stairs safe for family and pets. The clear design allows for the natural beaty of your steps to stay while keeping you safe from slips and falls. Unlike other clear stair treads, there is not harsh sandpaper grit and you can feel safe walking bare footed on these treads. It helps pets get up and down stairs without slipping. PVC free, these peva plastic stair treads are a propiertary design to ensure your safety. Adhesive backing to stay put on the stairs. Comes with Free Roller Tool for easy installation. Make your stairs safe for family, friends, and pets. Clear design to show natural steps. Individual Tread Size: 4" x 26"
Please clean the steps before applying the treads, Use roller to firmly and evenly apply the treads, Avoid cracks, grout, and uneven surfaces.